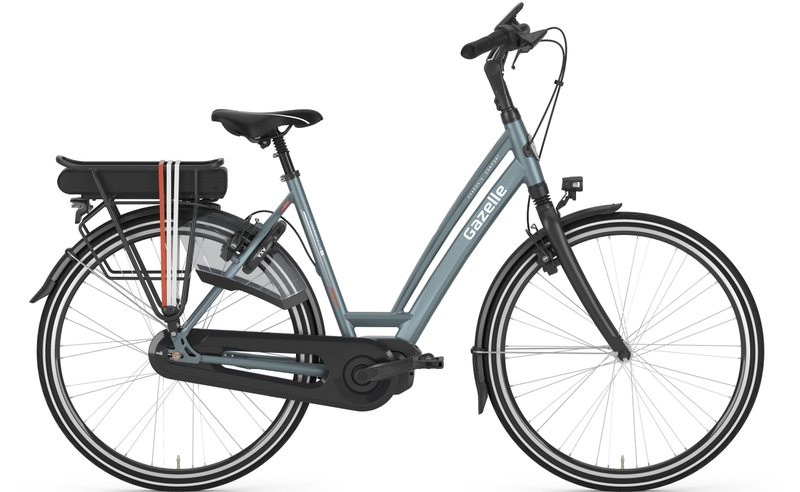 The Chamonix C7 HMS from Gazelle is a simple and extremely comfortable touring e-bike. Suitable for both ladies and gentlemen, the Chamonix C7 HMS has beautiful curves and elegant lines. It sports the same quality and exceptional build quality as every Gazelle, and is designed for lazy and leisurely rides out in the countryside. Equally, the Chamonix is more than comfortable with urban rides and commutes to the shops. Available in a wide range of frame sizes, both step-through and crossbar, this e-bike can cater for almost everyone! The powerful and smooth Shimano STEPs crank motor ensures easy riding on the flat, inclines and steep hills. It’s easy to read, centrally mounted display provides a wealth of rider information. Power assistance levels are changed easily via a simple unit on the handlebar. The Chamonix C7 HMS is indeed a very versatile e-bike with a lot to offer. A large 400Wh Shimano battery comes as standard with the option to upgrade to 500Wh for a very modest £170. This provides the bike with a hugley extensive range. Gearing is provided by a simple Nexus 7-speed hub for hassle-free gear changes and provides sufficient gearing for all terrain. Ever since 1892, Gazelle has been manufacturing the finest quality bikes that give the easiest and most comfortable ride possible. They have achieved such recognition throughout the years by their attention to detail resulting in bikes that are smooth to ride, cleverly designed and robust in quality. Designed for comfort, the Chamonix C7 HMS lightweight sprung front forks, and sprung seatpost too. Its Selle Royal Nuvola gel saddle and Gazelle Aerowing II Vario Comfort handles further add to the rider experience. Lighting the way ahead is a powerful and bright AXA Blue Line 30 lamp, and a Spanninga Brasa on the rear. Like all Gazelle e-bikes, the Chamonix comes with a 10-year warranty on the frame for on-going, worry-free cycling and 2 years on other components including motor and battery. The paint on a Gazelle is indestructible and guaranteed for 5 years. It’s rock-hard and scratch-resistant in every colour. Equipped with ultra responsive Magura HS 11 hydraulic rim brakes, easy to adjust handlebar positions, the Chamonix C7 HMS from Gazelle provides ultra comfort, style and quality.